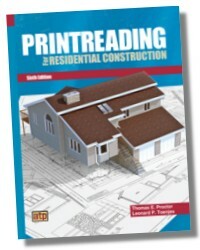 Printreading for Residential and Light Commercial Construction presents information applicable to the carpentry, electrical, mechanical, and general building trades, and provides authentic printreading experiences using contemporary prints. Single and multifamily dwellings, plus mixed-use and light commercial project plans are covered in the textbook. Specifications describing the building components and construction procedures are also included for two of the projects, the Brick-Veneer Residence and the Wendy's® Restaurant. 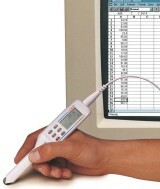 This edition includes information on a newly constructed 19,000 sq ft multistory veterinary center. 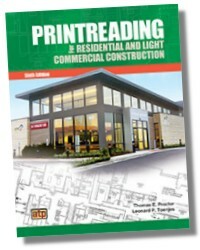 Also included is updated coverage on building codes, the CSI MasterFormat™, LEED® certification, and green building technology, which complements the prints. 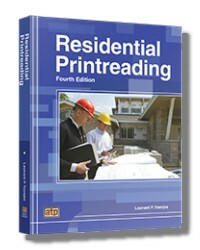 A quantity takeoff chapter provides an introduction to the principles and techniques of printreading for quantity takeoff and can be used as a basis for a construction estimate. 549 pages 8-1/2 x 11in.